San Juan is a secluded village in the north of the island, with a very laid back and traditional vibe. 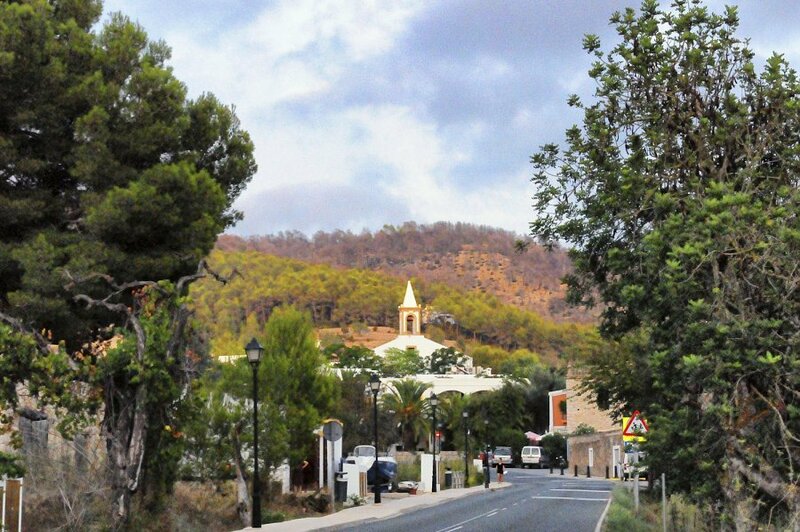 San Juan (Sant Joan in Catalan) really is the last village in Ibiza. Arrive there and the only place left to go is the beach at Cala San Vicente, some kilometres down a steep, twisting road through pine clad hills. It's therefore probably the least affected by conventional tourism. This traditionally rural area is home to the most number of agrotourism hotels in all Ibiza. Visitors come here to step back in time to the days when the island was a quiet Spanish backwater. It's also hippie headquarters for those who have moved to the island to seek an alternative lifestyle embracing spiritual philosophy and a healthier way of life. As usual, the village is lorded over by the 18th century whitewashed church. Unusually the rest of the architecture is not all the traditional cubic, bleached white Ibicenco houses. There's an air almost of Atlantic Spain with stone built houses with sloping roofs on the outskirts of the village. The main street is a joy. Quiet, flower bedecked, wrought iron balconies and ancient wooden doors lead visitors up the cobbles and steps. Here and there the scent of garlic, the hiss of coffee machines and the chatter of clients in the bars. Each Sunday San Juan comes to life with a lovely artisan market in on the village square opposite the church. There is a great selection of organic produce and artisan-crafted goods, for example homemade Hierbas (Ibizan herb liqueur), organic bread, fruits from the island like figs and almonds, handmade soap, leatherwear, candles, jewellery and much, much more. At midday local bands play live on the square and there are local bars where you can have a drink or snack. The market takes place all year round and is very popular with islanders and tourists alike. The day of 24 June is the day of the village's patron San Juan, Saint John the Baptist. The evening before, on the 23 June, a raucous fiesta featuring firecrackers and bonfires to drive away evil spirits and welcome the summer is celebrated in the village. There's a great custom fo this night that anyone can easily take part in. All you need do is to write a list of all the bad things that happened to you in the last year and then throw it into one of the many little bonfires scattered around the village. Then, jump over the fire to leave all those bad things in the past. Aftwarwards, as tradition dictates, you should write another list with all the good things which you want to happen to you in the year to come - this is for you to keep. Cala San Vicente is worth a visit for its fine sandy beach and safe waters. The cave of Es Culleram, a shrine to the Goddess Tanit dating back 2400 years can be found on the way to the coast and the restaurant Can Gat by the beach is such a popular seafood eatery that local people drive miles to get there.